I love this bread recipe. I like using coconut oil instead of hydrogenated oils, which this recipe does, or, if you rather go a cheaper route, you can use butter in place of the oil. I can’t really notice a difference in taste when I use one or the other. 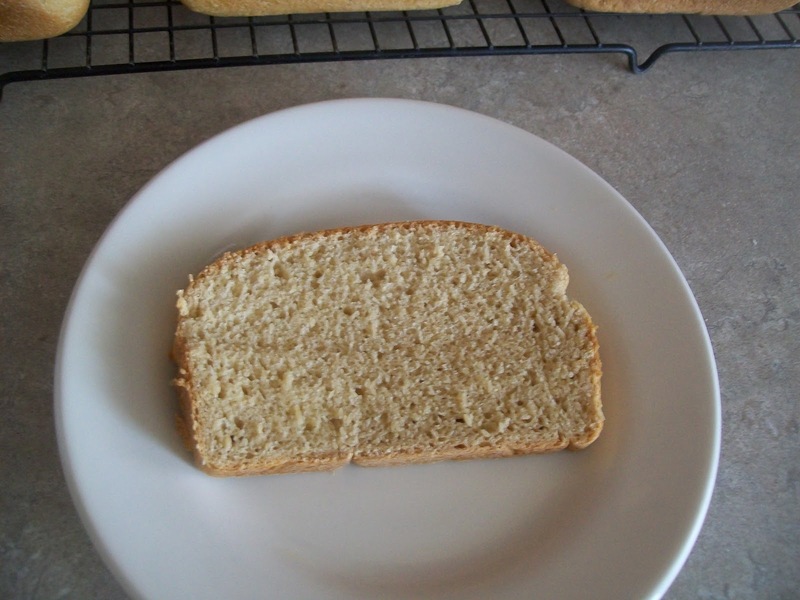 This recipe makes 4-5 loaves(I usually make 4 large loaves and 1 smaller loaf that I turn into cinnamon bread by rolling it out and spreading it with butter, a little cinnamon and coconut sugar) and I make it for my family of 7 about once a week. We usually eat the first loaf, or at least half the loaf, as a snack the first day because we love fresh, warm bread right out of the oven. I freeze 3-4 loaves, depending on how much was left from the warm loaf we just devoured, and we eat those over the week. We like to have this with butter or peanut butter and honey, either toasted or just warm as a snack, and all of us eat it as sandwich bread for lunch as well. 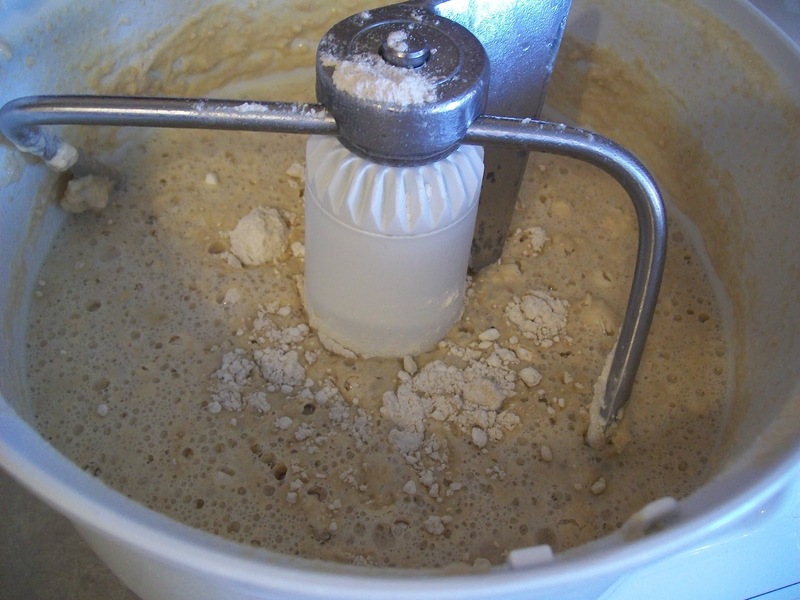 If you don’t have a bread mixer, you can knead it by hand, but I’d halve the recipe because it’s a workout. Just follow all the same directions but mix it in a large mixing bowl and do your kneading in the bowl as well. Also, you can optionally brush the tops with butter, once they’ve come out of the oven, which will make the crust nice and soft. 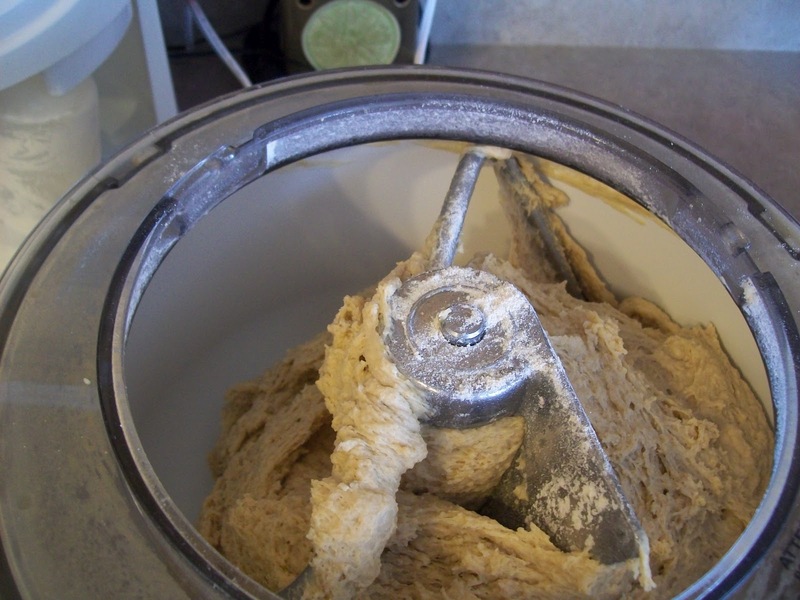 Set up your dough hooks in your Bosch and mix together 8 cups wheat flour, warm water(120 degrees; I warm water in a saucepan with my candy thermometer inside), and yeast on speed 1. Allow it to rest for about five minutes with the lid on. Add the salt and butter/oil, dough enhancer, honey and vital wheat gluten and mix together. Be sure your butter is softened, if not, melt it, or if you’re using coconut oil and it isn’t runny, melt some in a saucepan or microwave. Add your optional ground golden flax and the remaining flour, one cup at a time until the dough cleans the sides of the bowl. Be careful not to add too much flour. Allow the dough to knead about 5-6 minutes on speed 2. Preheat your oven to 180 degrees to warm it up for the rising process; we’ll turn it off before we put the dough in the oven to rise. Grease four bread pans. Divide the dough and shape them into four loaves (I actually do 4 normal sized bread loaves and one smaller one that I turn into cinnamon swirl bread), if you have a kitchen scale you can have a more exact division of the dough between your pans, otherwise just eyeball it. With my kitchen scale the four large loaves end up being around 2 lbs each. This part is a bit sticky so feel free to grease your hands well. 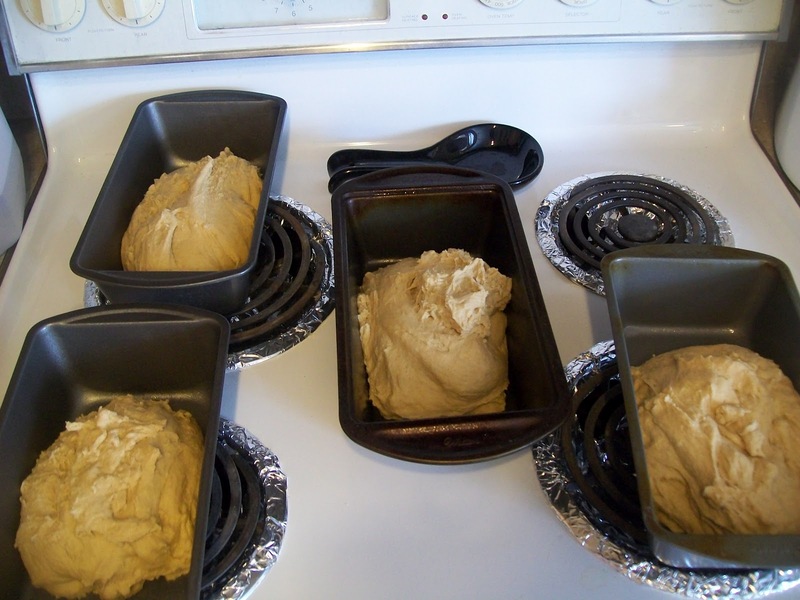 I shape the dough into loaves using both hands, holding the dough with my thumbs on top and fingers underneath and then squishing it under all around the edges. That’s the best way I can think of to explain. Then I flip over the bread loaf and pinch the insides together so you don’t have any holes in your bread. In the picture below, I’ve pinched the bottom together on half of the loaf so you can see the difference. 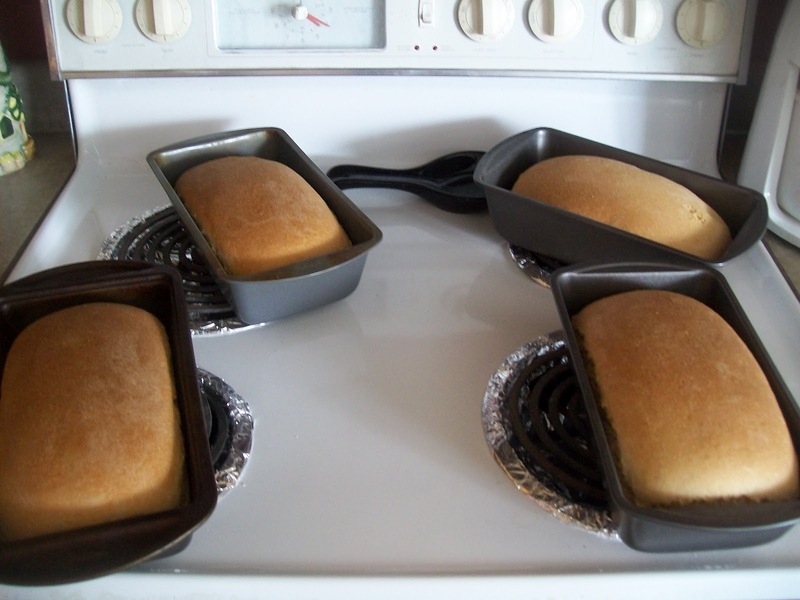 Put the formed loaves in your greased bread pans and turn off the oven. 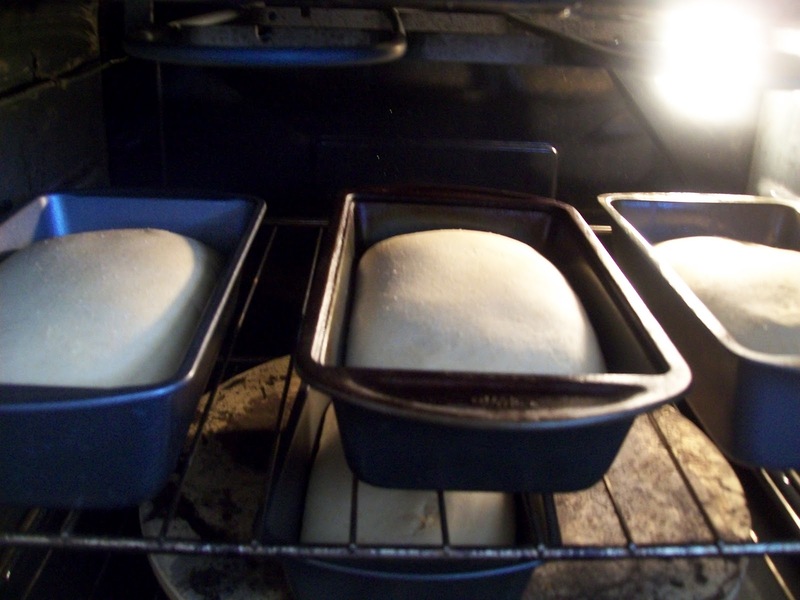 Let the dough rise in your warmed oven for 30 minutes(oven is off), until the dough rises above the tops of the pans. Do not remove the bread from the oven or open the door during or after this time. Once your kitchen timer goes off, set your oven to 325 degrees and bake for about 30 minutes; the tops will be golden brown and when you knock on the bread you’ll hear a slight thump. Remove bread from oven and with a butter knife, go around the edges to loosen. Flip onto cooling rack. Nothing better than home made bread! 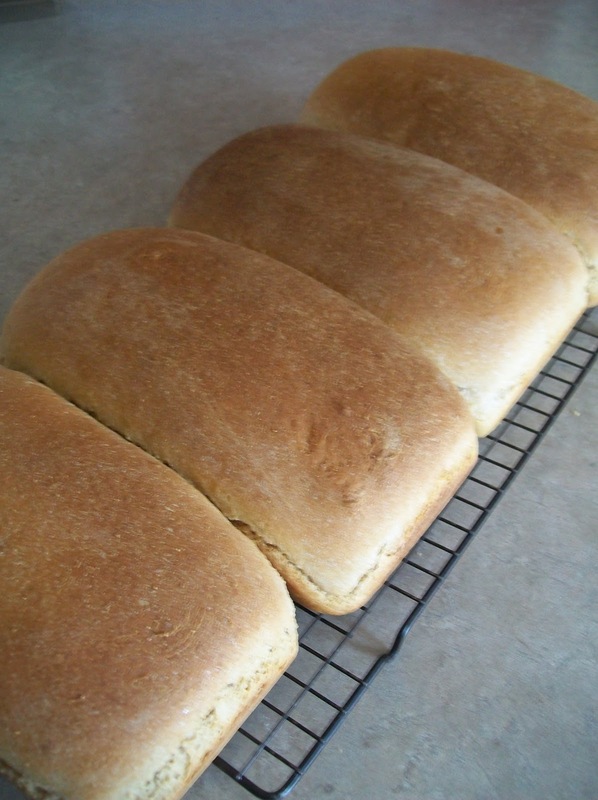 My kids love the smell and know instantly that we’ve been baking bread when they walk in the door from school. In a medium saucepan, warm your 6 c water until about 120-130 degrees Fahrenheit; I monitor mine with a candy thermometer. While waiting for your water to warm up to the right correct temperature, in a Bosh mixer with dough hooks, add 8 cups wheat flour. Add water, mix to combine, then add yeast and mix to combine. Let rest for a couple of minutes. Add gluten, dough enhancer, honey, salt and butter/oil and mix together. Add optional ground flax and the remaining flour, one cup at a time until dough cleans the sides of the bowl. Be careful not to add too much flour. Allow it to knead another 7 minutes. Preheat oven to 180 degrees to warm for rising process. 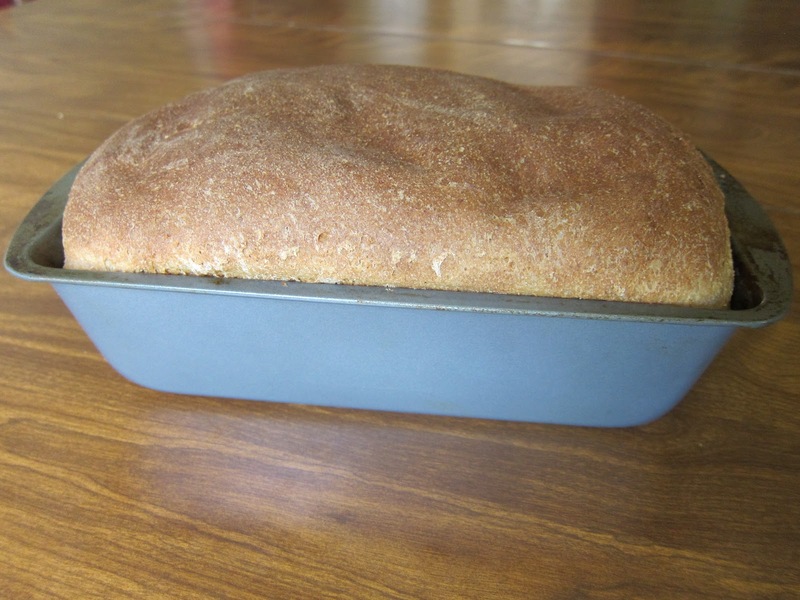 Grease four – five bread pans. 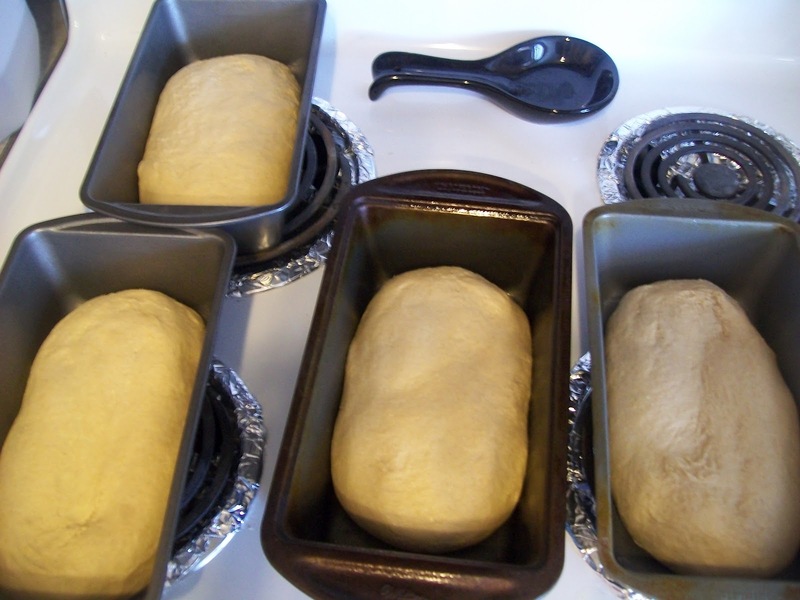 Divide dough and shape into four to five loaves. This part is a bit sticky so feel free to grease your hands well. Turn off oven and put bread inside. Let rise in warmed oven for 30 minutes until dough rises above the tops of the pans. Do not remove the bread from the oven or open the door during or after this time. Once it’s done rising, set your oven to 325 degrees and bake for about 30 minutes, until tops are golden brown. Remove bread from oven and with a butter knife, go around the edges to loosen. Flip onto cooling rack. 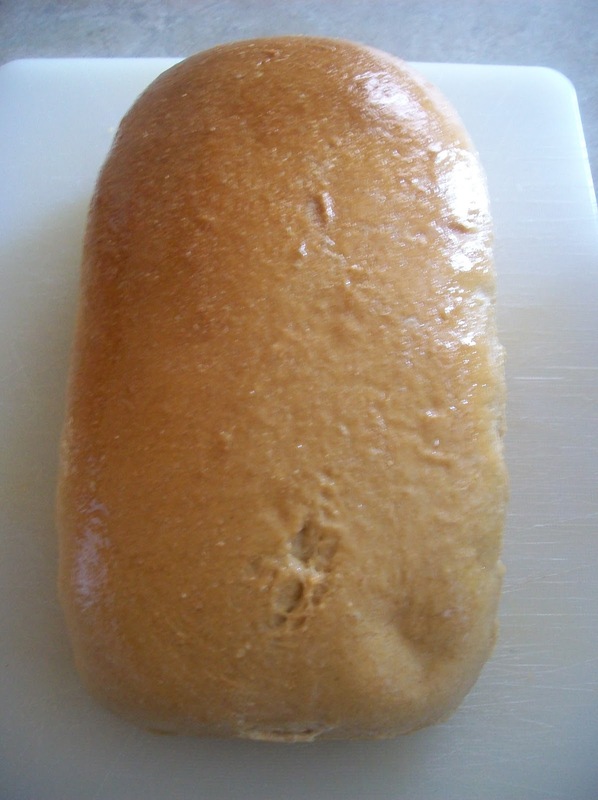 Optionally brush tops with butter so they soften.This bread will stay good for several days, or you can freeze for a month in bread bags(I save my bread bags from the grocery stores and store them in there, and when I freeze them I also stick them in a plastic bag for double coverage). 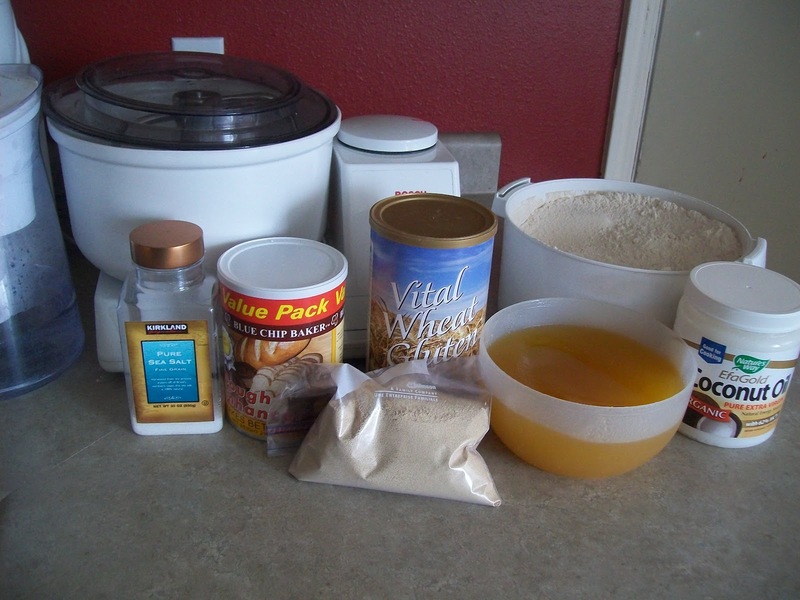 I tried this approach using my bread machine recipe, doubling it and mixing/kneading in the Kitchenaid 4.5 qt machine. It came out well but did not rise as much as in the machine. 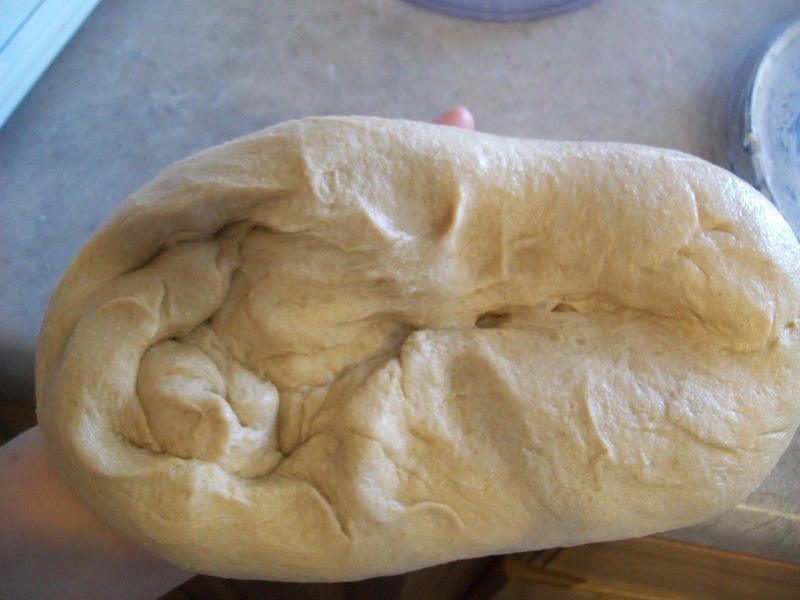 In your recipe I notice that you only need to let the dough rise once. Is this the function of the wheat gluten and dough enhancer?